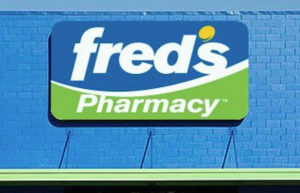 MEMPHIS, Tenn. — Fred’s, Inc. reported financial results for the second quarter and six months ended August 4, 2018. Net sales down 4.3% to $419.7 million in second quarter 2018 versus $438.5 million 2017. We recently announced an agreement with Walgreens Boots Alliance, Inc. to sell pharmacy prescription files associated with 185 Fred’s stores. This transaction should allow Fred’s to almost entirely reduce the balance on our ABL Facility, allowing us to focus on returning our remaining business to profitability. We expect to close this transaction over the course of the fourth quarter,” he added. Fred’s net sales for the second quarter of fiscal 2018 decreased 4.3% to $419.7 million from $438.5 million in the second quarter last year. Comparable store sales for the quarter decreased 3.5% compared to a 3.0% decrease the second quarter of last year. Comparable store sales were down 6.1% for the front store and down 0.5% in the retail pharmacy. A significant reduction in circular marketing was the main driver of reduced comparable store sales in the front store for the quarter. During August, the company reinstated marketing programs consistent with prior levels, which it expects will improve the trend seen in the front store during the second quarter.